where is the fault shear strength and is the normal compressive stress acting on the fault. The faults that produced giant earthquakes are the weakest, smooth and do not have any geometrical irregularities such as subducting seamounts. The rupture-zone average stress drops in great earthquakes are as small as 2 to 5 MPa. This article attempts to use the highly compressed methane gas mass model to geochemically, geophysically and geomechanically interpret and explain the occurrence of great earthquakes at subduction fault with long recurrenceintervals. The gas model can be described as follows with thereference to Figure 1.
where is the actual frictional coefficient of the fault rocks, usually equals 0.6 to 0.8. If the in-situ stress = 400 PMa, then P(0) = 360 ~ 380 MPa. Rapidly,at the time t = 0, a huge amount of gas with the mass , volume , pressure P(0) and temperature T(0) is escaping the reservoir trap at the focus A and, flowing and expanding quickly into upper and adjacent rock masses along the weakest fault zones, which causes the seismic waves globally. The highly compressed gas mass is jetting into the seawater and expanding quickly, which induces seawaters and tsunami. Subsequently, it is rapidly jetting and flowing into the atmosphere, which causes temperature drop, pressure fluctuations, clouds, rains and/or snows over vast sky regions. The gas also carries electrical charges, which can cause the disturbance ofelectromagnetic fields of the ground and the atmosphere. The expanding energy released by the escaped gas mass can be estimated using the following equation[4,5]. Under the constraints of the confining tectonic stresses and crustal rocks, the arc crust is subsiding substantially due to the huge loss of the gas mass support in the inclined subduction fault zones. Immediately, the arc crust is moving largely seaward due to both the subsidence and the high compressive horizontal tectonic stress . The escaped gas volume approximately equals the subsided volume of the crustal rocks. The release of the gravitational potential energy of the rock crust mass due to its subsidence can be estimated using the following equation. where is the average subsidence of the crustal rock mass , and g = 9.8 m/s2. The continued escaping and flowing and expanding of the highly compressed gas masses in various existing or new gas reservoirs induce numerous aftershocks. If the escaped gas mass = 1 km3, the total gas volume V(0) at the pressure of 360 to 380 MPa can be 75 to 180 km3. If the ruptured area of the great earthquake source is 200 km long by 50 km wide, the average thickness of the gas reservoir is about 7 m to 18 m.
With time, the aftershocks become less and less, which shows the gases in various reservoirs gains compatible and equilibrium with trap strengths and the confining tectonic stresses. In the meantime, the subduction fault reservoirs re-collect and re-accumulate new gas masses from deep and surrounding rocks. Therefore, it takes time to rebuild fault gas mass and pressure to the level of trap rock rupture, which is consistent with great earthquakes of long recurrence intervals. This process of gas mass and pressure rebuilding is strongly affected by the chemical reactions and physical conditions of the hot mantle and core materials. Because of lack of gas mass and pressure in the subduction fault zones, most of the arc rocks continues to relax and moves seaward following a great earthquake. But, they would gradually reverse direction to move landward as the gas mass in the subduction fault has collected and accumulated enough. 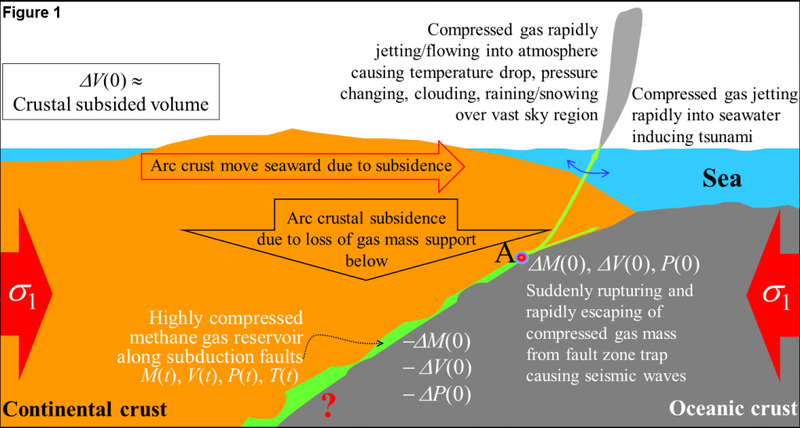 The gas pressure becomes high enough and gasmass can transfer the landward movement of the oceanic crust to the continental crust, which may indicate the possible occurrence of the next great earthquakes. If it needs 100 years to rebuild the highly compressed gas mass of 1 km3 at a particular subduction zone for nest great earthquake, the accumulation rate of the highly compressed gas in the fault reservoir would be about 30,000 m3 per day. Wang, Kelin., 2015. Subduction Faults as We See Them in the 21st Century, Birch Lecture,Tectonophysics, December 16, 2015, the 2015 AGU Fall Meeting, San Francisco, USA. Byerlee, James D. (July 1978). "Friction ofRocks". Pure and Applied Geophysics,116 (4-5): 615–626. doi:10.1007/BF00876528. ISSN 0033-4553.